The Deputy Administrator of the U.S. Department of Transportation’s National Highway Traffic Safety Administration (NHTSA) recently urged motorists to exercise caution in a press release that addressed a string of recent accidents at school bus stops around the country. NHTSA has charged both individuals and the media to help educate communities on ways to ensure all students arrive to and from school safely, including following state laws when approaching a school bus or school crossing and avoiding distracted driving. This brings attention to the fact that we should all strive to help keep the children our community safe while they are migrating to and from school. What Recent Incidents Spotlight the Severity of the Problem? Unfortunately, the injuries that result from school transportation accidents can be quite serious. Just a few months ago, CBS News reported that five separate car crashes at school bus stops resulted in the deaths of five students within the same week. These early-morning accidents which occurred in Indiana, Mississippi, Pennsylvania and Florida also resulted in the hospitalization of six other children. How Common Are These Incidents? When it comes to any source of potential harm to children, even a single incident is disturbing and unfortunately, statistics indicate that children are injured more often than any of us would like to think while simply trying to get to school and obtain an education. Approximately 149 young pedestrians have died in school transportation related crashes since 1998. Of these fatalities, 69 percent involved school buses, 24 percent happened because of other vehicles involved in the crashes, and seven percent occurred as the result of vehicles functioning as school buses. Sadly, these statistics indicate that the youngest students also have the highest risk of incurring a fatal injury. Almost half of the school age pedestrians who are killed in school transportation-related crashes are, tragically, between the tender ages of five and seven. What Legal Measures Are in Place to Keep Our Children Safe? 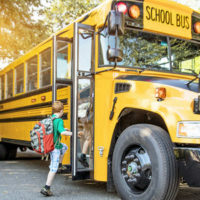 While it may be surprising to learn that federal law does not require seatbelts on school buses, the silver lining is that the Sunshine State has issued legislation in this area although many other states and the federal government have not. Under Florida law, any bus that is owned, leased, or operated by a school district in the state is required to ensure that every passenger is wearing a seatbelt while the bus is operating. Whether the bus is equipped with safety belts or a restraint system, the passenger has to utilize it. Has Your Child Tragically Been Injured in a School Transportation-Related Accident? We understand how serious the tragic consequences of a school transportation-related accident can be and we sympathize with what you and your loved ones have experienced. Contact the experienced West Palm Beach personal injury attorneys of The Pendas Law Firm today and we will help you recover the compensation you are entitled to.